“When registered nurses can speak freely and organize without fear of intimidation, retribution, or harassment, it empowers them to provide quality, therapeutic care and to advocate for patients for improved quality of care." The hospital is waging an aggressive campaign, spending millions of dollars, nurses allege, on anti-union efforts that appear to violate legally protected workplace rights. The National Labor Relations Board (NLRB) has determined there is merit to allegations that the hospital has violated federal labor law in restricting the rights of its registered nurses who are seeking union representation. A first NLRB hearing on the nurses’ complaint is scheduled for June 4 in Baltimore. Inadequate conditions and other standards, compared to other nationally recognized university hospitals, have led to high turnover and eroded patient care protections and employee morale, say Johns Hopkins RNs. In December 2018, nurses conducted a unit-by-unit survey documenting these conditions and published the findings in a patient care report that can be viewed here. The Maryland legislators’ letter to Hopkins management is in addition to letters sent earlier from U.S. Senators Chris Van Hollen and Ben Cardin, and U.S. Representatives Elijah Cummings and Johns Sarbanes. 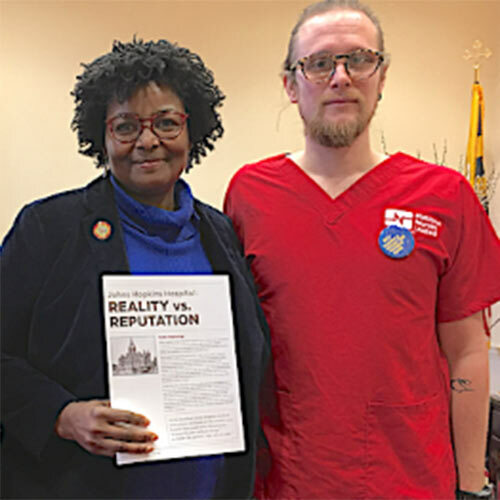 The Baltimore City Council passed a resolution in support of the Johns Hopkins nurses’ campaign in December 2018.